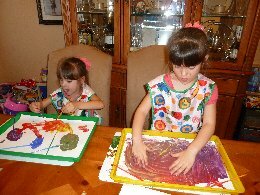 The Lil Divas are exploring Rainbows this week which of course means we are talking about colors! Today, we specifically focused on color mixing - using primary colors (red, yellow & blue) to make secondary colors (purple, orange & green). It was messy but fun! I knew I wanted the Lil Divas to mix primary colors and make secondary colors but I also wanted to introduce the concept of a color wheeel. 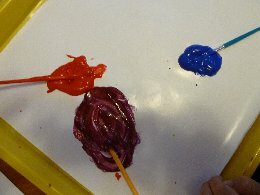 I wanted to find a fun way to use the paint colors they mixed up to make our wheel. 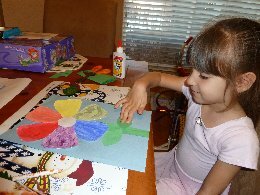 I was inspired by Aimee over at Classified: Mom who made an awesome Spring Flower Color Wheel! I knew this would be perfect for my Lil Divas. 1. Prep - I put some red, yellow and blue paint on fingerpaint paper (it's pretty good at preventing tears and leaks), spacing them far apart. 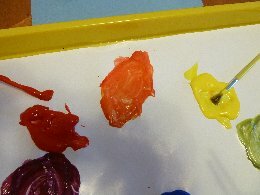 I also provided 6 different brushes so we didn't mix up all our colors by using the same brush. 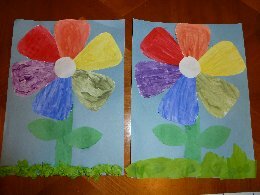 After Dance class the petals were dry and ready for us to complete our Flower Color Wheel. 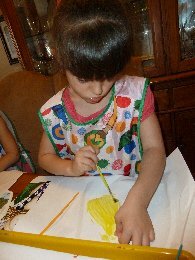 The Lil Divas glued on the stem and we arranged the colors in order, reviewing which primary colors had mixed together to produce ﻿which secondary colors. 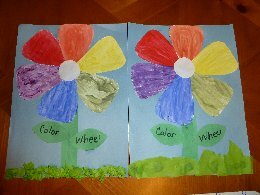 Hope you enjoyed our Flower Color Wheels! More Rainbow themed fun to come! Thanks for the lovely comments on my blog. 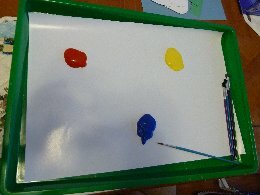 This is a great way to teach kids about secondary colors. I am having a giveaway on my blog. $40 to get an adorable drawstring backpack and great spring hair accessories from o&el. check it out! This looks like a lot of fun! I will have to try it with my boys. 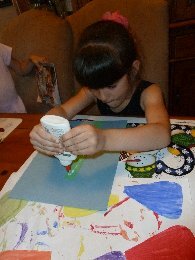 We homeschool and are always looking for some fun activities! I am also mom to a diva!! Following from the Thursday blog hop. 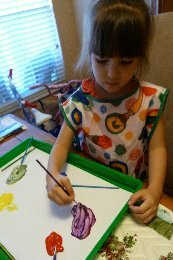 I love all of these great rainbow ideas! So much fun. Thanks for participating in News from Your Nest & hope you'll visit my3littlebirds again soon. This is a great way to introduce colors. Great idea! The flowers are lovely! 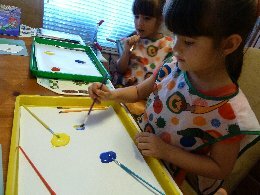 A perfect way to explore colours! Thanks for linking this up with For the Kids Friday at Sun Scholars! 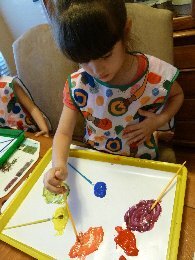 Thanks for sharing your fun color mixing activity. I love it!